Here's a nice early-autumn dinner we had recently. 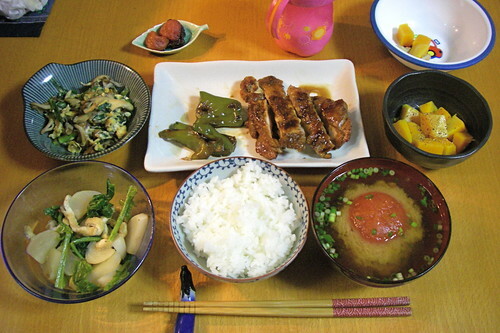 From top left: maitake-niratama (maitake mushrooms and garlic chives stir-fried with egg); umeboshi (pickled ume plums); tori no kurozu teriyaki (chicken teriyaki with black vinegar, served with green peppers); simmered mystery squash; marugoto tomato no misoshiru (miso soup with whole tomato); steamed rice; kabu to abura-age no nibitashi (simmered turnip roots and greens with fried tofu). The last time I posted about a meal with the soup I had a few questions about it. It's actually really easy to do and very yummy, with the tomato adding a pleasent sweetness, amplifying the umami of the miso and dashi, and giving an unexpected but nice kick of acidity. 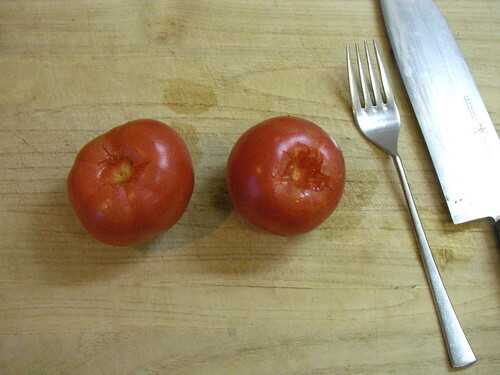 Plus if you use really good tomatoes you get that lovely garden-fresh tomato flavour. Try it for yourself: the recipe follows. Prepare the dashi in a small pot. Wash and core the tomatoes. 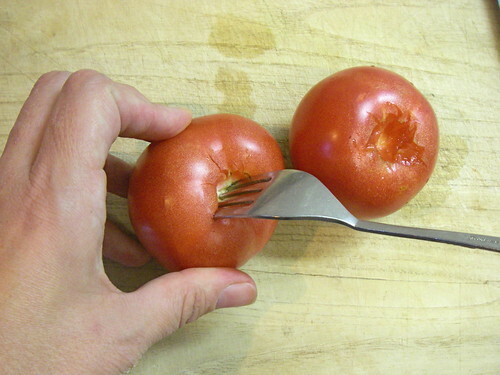 Pierce the core of one tomato with a fork. 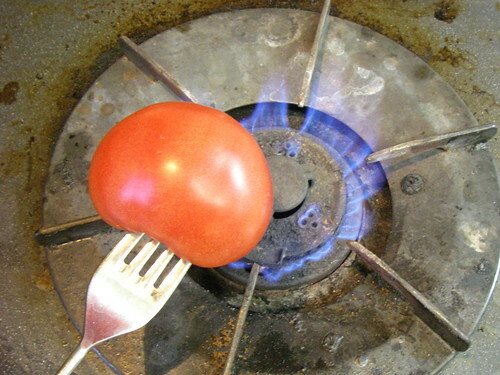 Holding the tomato over an open flame and turn to evenly char skin. 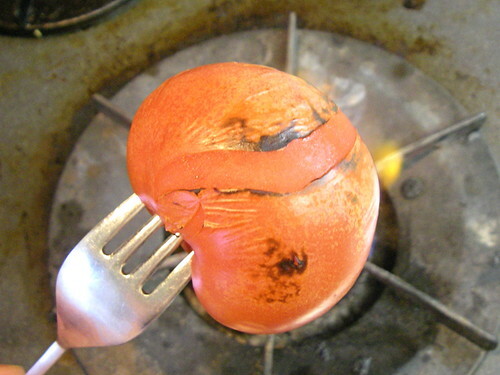 It is not necessary to completely char the skin; it should be blackened in some areas and have a crack or two. It shouldn't take more than half a minute. Set aside to cool, repeat with other tomato. 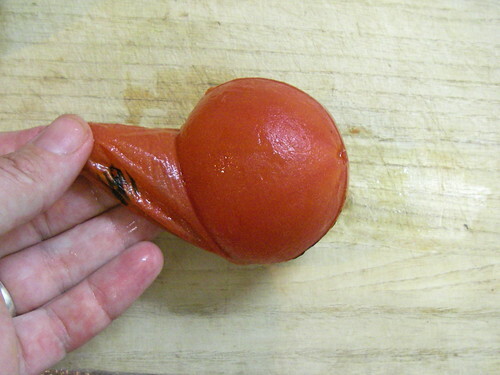 Peel the skin off of both tomatoes, taking care not to damage the flesh. Add the tomatoes to the dashi, bring to a simmer over medium heat, then turn to low and cook until tomatoes are soft, about five minutes. 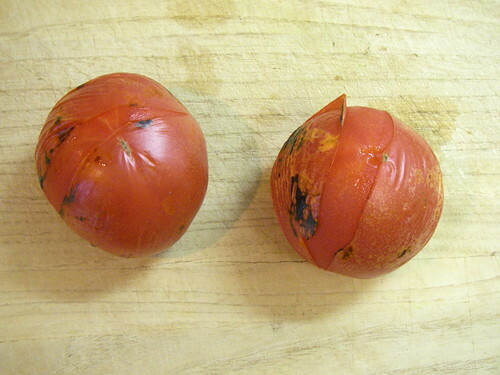 Do not boil or overcook, or tomatoes may disintegrate. Meanwhile, thinly slice the hosonegi. Stir in miso and taste, adding more if needed. 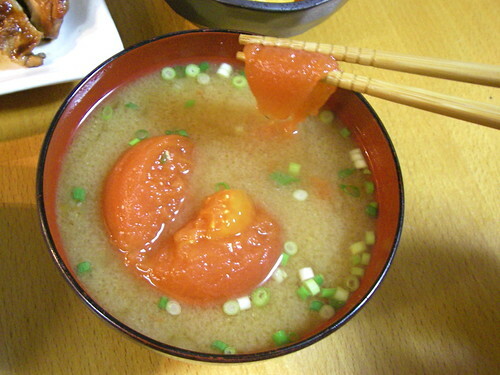 Transfer each tomatoe to a soup bowl, ladle broth over and garnish with the hosonegi. 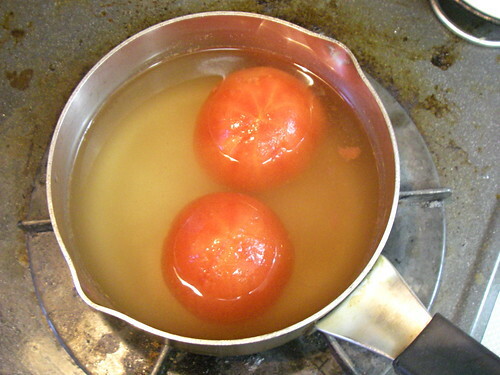 Note: if gas range is unavailable or if using a large number of tomatoes, peel them in the usual way: dunk into rapidly boiling water for a few seconds, remove to a bowl of ice water, and peel. wow! what a feast! so many yummy dishes..i would be delighted with just 2 or 3 of them! i will def. 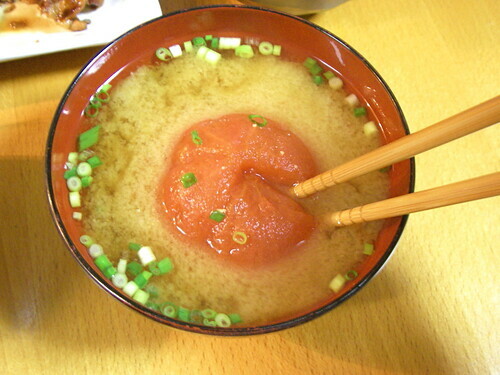 try making the tomato miso soup. looks so delicious! However do you find the time to cook so many yummy dishes with a little one to look after at the same time? Look at you! Posting a food tutorial while looking after a toddler! Go mommy! That looks delicious! Thank you for the recipe. Oh c'est si apétissant tout ça! That Tomato Miso soup looks amazing! I saw this on your blog and decided to make it as part of my lunch. We don't get a lot of vine ripened tomatoes where I live, so I used smaller cherry tomatoes which have more flavor than the regular hamburger-type. It worked out well as I only made a small amount. You're right...it was delicious.